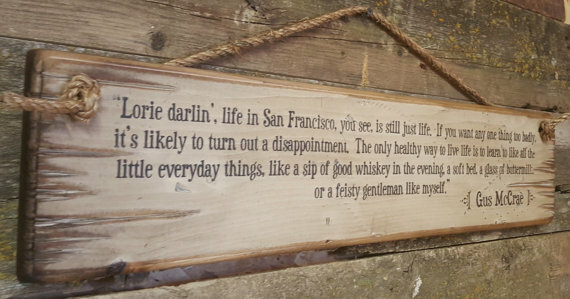 "Lorie darlin', life in San Francisco, you see, is still just life. If you want any one thing too badly, it's likely to turn out a disappointment. The only healthy way to live life is to learn to like all the little everyday things, like a sip of good whiskey in the evening, a soft bed, a glass of buttermilk, or a feisty gentleman like myself." 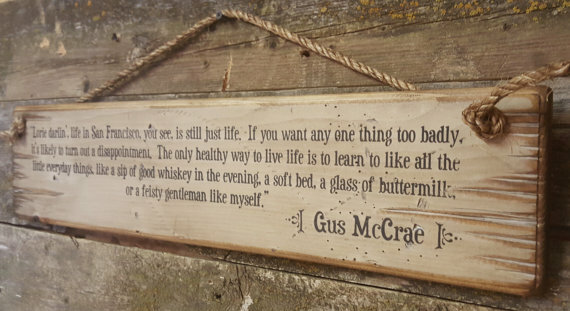 Gus McCrae. Gus was trying to explain to Lorena to enjoy life no matter where she was. This white background sign measures 5.5x24 and comes with the grass rope hanger for easy hanging. Handcrafted with pride!